Malmö: Berghs Förlag AB, 1979. This is the Swedish edition of Tony Hillerman's 1978 Listening Woman, the third novel in his Navajo Detective series. 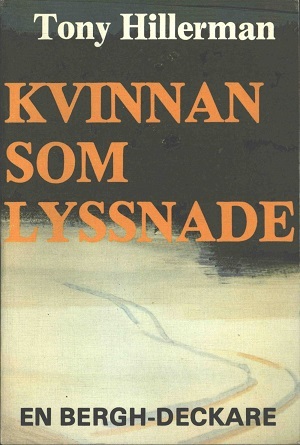 Hillerman 's text is translated by K. Arne Blom, a long-time collaborator with Hillerman, who translated many of Hillerman's novels into Swedish. Binding: Pasteboard in full-color, comprising an abstract watercolor in dark blues that bleeds into negative space at the bottom of the cover. Hillerman's name is in white capital letters at the top of the front cover, with the book's title in orange capitals over the darkest part of the abstract band of color.